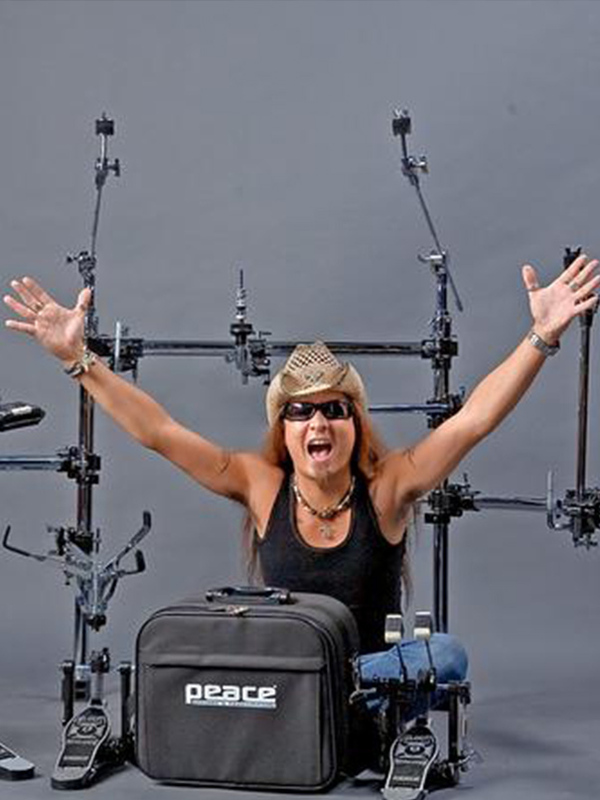 Kenn Youngar has been playing drums since the age of 16. Since his mother laminated a note giving permission for her son to play bars, it’s never been the same. Playing the Canadian music scene for 10 years was enough to convince him that State side was the place to be. Kenn moved to Dallas, Texas to find his niche in the rock and roll history books, or at least sneak his flier in there somehow. He formed Strangleweed in 2000 and took off running. They became main support for Lillian Axe, Styx, L.A. Guns, Angel, Bullet Boys, Molly Hatchet, Seven Mary Three, Fastball, Blackberry Smoke, Tracii Guns, and Drowning Pool to name a few. Strangleweed’s history included annual rebooking at festivals, biker rallies and fairs but the highlight came when joining the US Armed Forces Entertainment Program. Kenn’s group had the honor of playing for American, Australian, Canadian and British troops in such exotic locations as Japan, Singapore, Diego Garcia and beyond the Indian Ocean. Kenn became international coming to the states, now he was global. If that wasn’t enough to fill his plate his guitarist Josh Allen asked him to join his side project Turning Point for a video, album and national tour with Immortal Recording act Adema. That tour led to opening for Alice Cooper, Black Sabbath, Queensryche, Shadows Fall and Evans Blue to name only a few. Endorsements from Page Drums, Los Cabos Drumsticks, S-Hoops and Peace Drum Hardware came knocking as well as energy drinks, clothing and other sponsors. As they say “a rolling stone gathers no moss” and Kenn’s sights are now focused on organizing an annual all day music festival in Costa Rica benefiting “the Roberta Felix Foundation” that develops resources for disabled children and their families in rural communities in Costa Rica. The first annual Costa-Bazooka concert series will bring 6 American bands and 10 Costa Rican bands to the coastal town of Quepos for an extravaganza with country wide attention while raising awareness to the Roberta Felix Foundation and its important role in the community. Roll on Kenn, roll on.